Artech Palm Grove at Polayathodu is inspired by the goodness of nature, thereby redefining the standards of lifestyle living in Kollam. 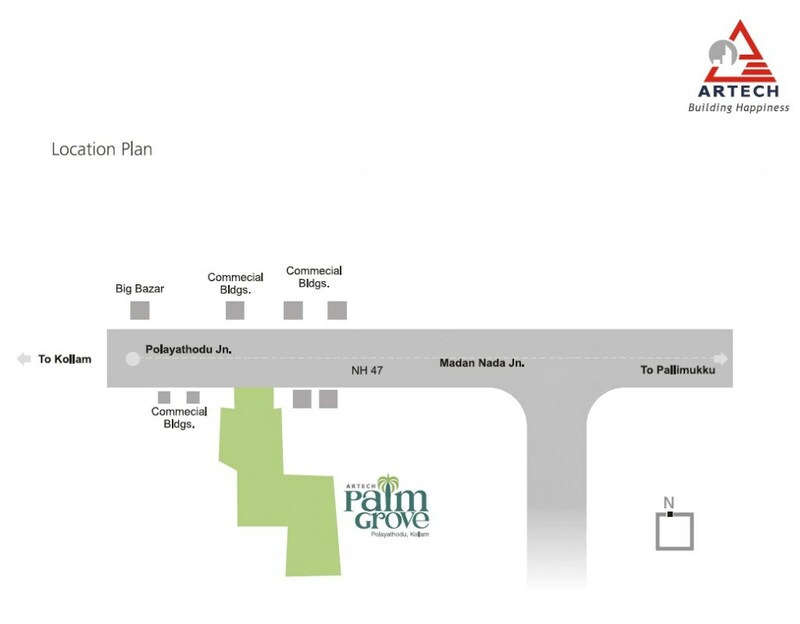 Thoughtfully designed with clean, sleek architectural lines, Artech Palm Grove exudes style and sophistication. Offering a broad selection of 2 &3 BHK apartments in 5 different layouts, and in sizes ranging from 1360 to 2170 sq ft. Every individual unit is resplendent with superb finishing, fixtures and fittings. A plush entrance lobby, swimming pool and a fully equipped air-conditioned Unisex Gym and other modern amenities compliments the calm and serene living spaces inside each unit. Lift lobby and fascia wall & floor using composite marble / granite / vitrified Tiles, as per the architect’s design. Staircases using granite / vitrified flooring with hand railing using matt finished SS,with or without toughened glass as per architect’s design. Car park Area: Grano flooring with grooves or exterior grade paving tiles. Foyer / Living / Dining using 80cm X 80cm premium vitrified tiles. Kitchen / Bed Rooms: 60cm X 60cm vitrified tiles. Master Bed Room: Laminated wooden flooring AC4 Grade. Master Toilet: Designer ceramic tile concepts 30cm X 30cm for floor and 45cm X 30cm for walls up to height of 8′ 0″ (master toilet). Other Toilets: Designer ceramic tile concepts 30cm X 30cm for floor and 60cm X 30cm for walls up to height of 8′ 0″. Servants Toilet: Ceramic tile 30cm X 30cm for floor and 30cm X 45cm for walls upto 8’0″ height. Utility Room: 30cm X 30cm for floor and 30cm X 45cm for walls upto 4’6″ height and 2′ above the counter (if any). Balconies / Open Terraces / Decks: Rustic / antiskid / ceramic tiles 30cm X 30cm or Timber decking with MS / SS/ Glass railings. Soft landscape as per architect’s design also shall be provided. Sanitary Fittings: EWC wall-hung, concealed cisterns GEBRIT make, counter washbasin. All sanitary fittings shall be of ROCA / American Standard or equivalent. Faucets: All Faucets shall be single lever concealed diverters CP finish, heavy body metal fittings of Grohe / Roca or equivalent make. Provision for hot water connection shall be provided for overhead shower in each bathroom. Plumbing: All water supply lines shall be in ISI marked CPVC pipes. Drainage lines and storm water drain pipes shall be in PVC. Kitchen & Service area: Wall mounted Faucets / taps would be provided. Stainless Steel Sink multi bowl with drain board of Nirali make or equivalent shall be provided for the kitchen; stainless steel sink without drain board shall be provided for the utility and services areas. Towel rods, towel ring, soap dish and health faucets shall be provided inside the toilets. Window shutters: Prefabricated colour anodised aluminum. Door Frames: Main door frame and shutter shall be of seasoned teak wood. Outer face to be PU coated and Inner face melamine finished. Door Shutters: All internal door frames shall be of seasoned teak wood / hard wood with flush door shutter. All internal and external faces shall be melamine finish. Hardware: All hardware shall be in C.P Brass, tower bolts, doors toppers, ball bearing hinges. Locks shall be mortise of Dorset / Yale make or equivalent. Concealed copper wiring using Finolex or equivalent make with modular plate switches, centralized cabling system for all electrical and communication requirements. Wiring shall be done for lighting, 5Amps. 15 Amps and AC points in the Apartment. Switches: All switches shall be Honeywell / Legrand / Schneider / Crabtree or equivalent make. Generator: Power backup will be provided for all common services and selected light and fan point in each living, bedrooms inside apartment and a refrigerator point except Air-conditioning and Geyser points. Light fixtures for the Common areas, external areas, apartment balconies and at entrance door of the individual apartments shall be provided. Adequate ELCB and MCB shall be provided in each apartments. Provision for the GEYSER points and fresh air fans shall be provided for all toilets. Provision for telephone and Internet shall be provided in the living room and master bed room. Elevators: High Speed lift shall provided as per the Govt. norms in each core with automatic doors & SS brush finish of KONE or reputed make.